Reflexogenic – Producing or increasing reflex actions between muscles and joints. Myoskeletal – All soft tissues forming from the mesoderm including muscles, ligaments, joint capsules, discs, fascia and bones. One distinguishing feature of the Myoskeletal Alignment Technique® is the inclusion of deep-tissue routines for unlocking motion-restricted joints. For decades, massage therapists have searched for practical ways to identify and release fibrotic joint capsules, spinal ligaments and fixated facets while staying within their scope of practice. In the early 90s, a holistic soft-tissue approach emerged to help therapists accurately identify and correct pain-generating reflexogenic muscle/joint conditions. Surprisingly, the “key” that unlocked the DOOR to this muscle-joint mystery initially was revealed in a presentation to the American Back Association by the legendary osteopath Dr. Philip Greenman when he stated, “In the presence of vertebral dysfunction, palpable fourth-layer muscle hypertonicity will always be found.” The fourth-layer transversospinalis muscles include the rotatores, multifidus, levator costalis and intertransversarii (Fig. 1). These phylogenetically old laminar-groove muscles are the first structures neurologically stressed by joint blockage, and often are the very same tissues that prolong the dysfunction. restoring range of motion using sustained directional pressure on spinal-groove muscles and bones as the client flexes and extends through the fixated area. Under normal conditions, the superior vertebra of each joint smoothly flexes, extends, side bends and rotates on its inferior neighbor. 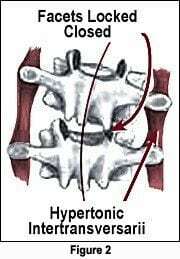 Too often, however, hypertonically SHORT spinal muscles bind one side of a joint altering its axis of rotation and center of gravity (Fig. 2). When therapists continually palpate lumpy, stringy or wiry fourth-layer intrinsic muscles session after session, underlying joint dysfunction is present and must be addressed. According to John Mennell, MD, all of the body’s synovial joints must have at least 1/8 inch of movement not controlled by voluntary muscle contraction. The term “joint play” was coined to describe this essential principle of normal, pain free, non-restricted vertebral movement. Deep tissue myoskeletal techniques focus on restoring joint play and stopping the reflexogenic battle between muscles and joints. This article offers an overview of current theories and myoskeletal strategies for preventing and correcting “catch 22” pain/spasm/pain CYCLES perpetuated by abnormal muscle/joint reflex actions. Working through the bulky paravertebral muscles and fascia, bodyworkers’ sensitive fingers frequently encounter small, hard and sometimes tender knots in the deep transversospinalis muscles of the erector spinae group. These highly innervated tissues located in the medial groove adjacent to the spinous processes contribute to rotation, sidebending and extension in each spinal segment. According to Greenman, “Fourth-layer muscles are dense in spindles and function more as proprioceptors than prime movers. When dysfunctional, they alter joint mechanics locally and alter the behavior of the larger muscles of the erector spinae group.” Therefore, muscles such as the multifidus and rotatores (and suboccipitals) are perceived as dynamic ligaments designed to stabilize the spine. Acting as supporting, information-gathering ligaments, they allow the brain to coordinate more gross movements of the vertebral column via longer-lever muscles that have greater leverage and mechanical advantage. The power GENERATED by short fourth-layer spinal muscles is easily underestimated. These highly innervated little critters readily pack enough punch to lock spinal joints open or closed with their strong torsional forces (Fig. 3). Holding a telephone with the shoulder to one EAR is a perfect example in which prolonged cervicothoracic sidebending unilaterally compresses joint surfaces, creating reflex transversospinalis and erector spinae spasm. This predictable neurological firing pattern represents the beginning of many functional scoliotic cases seen in the clinic. However, specially designed deep-tissue massage techniques can be very effective in releasing hypertonic myofascia and recovering joint play to fixated facets. Regrettably, some of the tightest transversospinalis muscles are buried deep to more superficial groove muscles such as the multifidus and spinalis, making it difficult and sometimes impossible to mobilize them with fingers and thumbs (Fig. 4). So, how can massage therapists access and release SHORT, concealed spinal muscles that bind joints and perpetuate aberrant pain and posture problems? In part two of the “Reflexogenic Relationship” series, I will demonstrate innovative soft tissue techniques for creating joint-play in fixated facets.